One of our most popular pages this year was Scrapbook #88, Small Layout Prototypes. Not only did it garner more e-mail attention than average, but a number of our readers responded by sending along information about their own favorite railroad scenes. Here, then are some more “potent prototypes,” all carefully selected to provide inspiration for lively small layouts! Our title photograph is a good example—a French reader sent this shot of a mining train in the lovely Chartreuse Mountains in southeastern France. 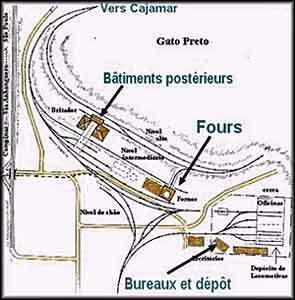 The railway brings limestone from the quarry to the cement works of La société Vicat. Here is more information about the little 60cm (two-foot) line (a former branch line) and its magnificent setting. Sticking with limestone-hauling railroads for a moment, also from France comes Gato Prêto, a layout sent in by Jacques Bratières, based on a venerable Carl Arendt design (ironically, featured on a different web site). 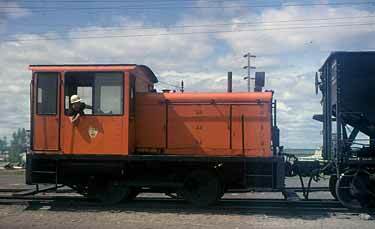 The prototype for both layouts is Gato Prêto on the Perús and Pirpora Railroad, a 60cm (two-foot) gauge limestone line in Brazil. The location (above left) has everything: a busy limestone kiln (Fr: four) dominates the scene; the rails enter on a sharp curve around the shoulder of a mountain (as if from a hidden fiddle yard), and they divide into three distinct levels of track—the top bringing limestone from the quarry to the kiln; the middle for loads of logs to fuel the kiln; and the bottom level for storage yard and engine service. All this activity takes place before a natural, limestone-cliff backdrop. The scene seems designed to become a small layout! Jacques has researched extensively and taken good advantage of the prototype opportunity in creating his N-scale standard (normal) gauge version of the scene. 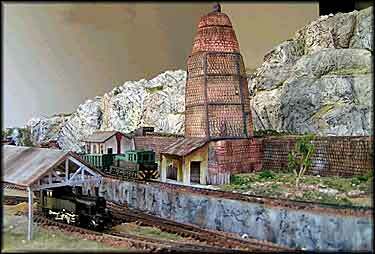 He has also created an excellent website to describe his layout in detail. His track plan and a few photos are shown here, to whet your appetite. Another industrial prototype, in Connecticut USA, also looks like it was designed to become a mini layout. 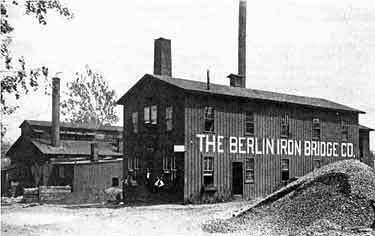 Charles Clarke sent us information about the Berlin (Connecticut) Iron Bridge Company, who in the 19th century fabricated metal-truss bridges for most of the Northeastern United States and beyond. The main factory, in Berlin, is shown above right. It was served by dual-gauge railway lines and had two transfer tables (traversers), one at each end of the plant, to handle the production (above left). Rail lines were laid straight through the works (below) to help move the heavy materials and truss structures. The illustrations shown here are all from a website prepared by the Connecticut Department of Transportation. There’s also a rare photograph of the factory interior here. A shelf-based switching model of this facility, with the side of the factory cut away and the industrial processes animated, could be very impressive… and capture a bit of industrial archaeology. Seaports are great places for train watching, and where better to observe than from the deck of a passing cruise ship? The Port of Livorno, in Italy, seems particularly suitable for observation in this manner… see Scrapbook #73 for an example. And here’s another, sent us by Dave Carson, from Stowmarket, Suffolk, England. 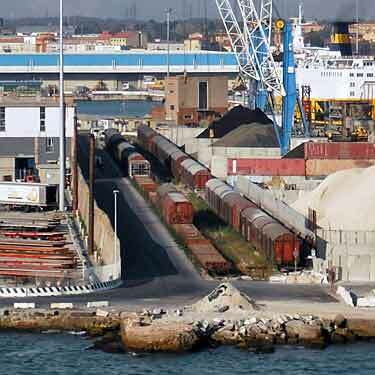 Dave remarked, “Here’s a couple of decent railway photos from Livorno—one of a dockside crane being shunted back into its position after we cast off and one of a three-track inglenook between two berths.” That little yard just cries out to become a cramped model, doesn’t it? From Long Island, New York USA, George J. Loy Jr. sent along a juicy menu of information about the one-time “duck capital of the world”—Eastport, NY on the former Long Island Rail Road (now operated by the New York & Atlantic Railway). This locale was a prime location for raising, packing and shipping Long Island duckling (more formally, Pekin duck). Many duck farms surround this community, and they mostly receive their fowl fodder from the Eastport Feeds Co. that is served by the NY&A (formerly by the LIRR). During the Golden Age of L.I. Duck (1930s to 1960s), probably more ducks were shipped from Eastport—by rail—than from any other single place in the world! Photo Montage: George J. Loy Jr. 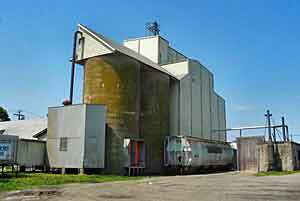 The only segment remaining of this busy online industry is the Eastport Feeds mill (top photo) with its large grain storage silos (lower left) still serving the area’s farms. This facility has operated under a variety of company names over the years. The track diagram from 1958 (center) shows how in the Boom Years the feed mill shared a long spur track with the duck packing plant, presenting some interesting shunting challenges to local train crews. 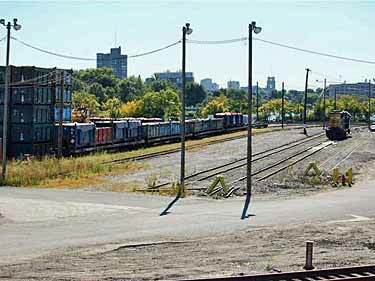 A second siding served a warehouse and was used as a team track by various local businesses. Both spurs came off a passing siding that also served the Eastport passenger station. Today the track remains, but only the feed mill has survived. The mill is still an active railroad customer, as shown on the cover of a 2008 NY&A calendar (lower right), featuring two GP38-2’s spotting a covered hopper full of duck feed at Eastport Feeds. 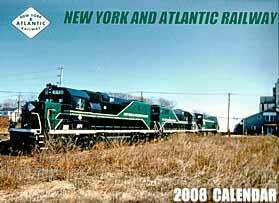 (This calendar is published by the Long Island Sunrise Trail chapter of the National Railway Historical Society.) Clearly this site would make an excellent switching layout (it could even operate as an Inglenook! ), and plenty of information is available to help the modeler. The panoramic photo of the mill (above) is part of a detailed article that George wrote for The Cannon Ball, newsletter of the Sunrise Trail Division of the NMRA’s Northeastern Region. His article is also featured on a large web page devoted to Eastport, where more information is available. Web searches will deliver even more useful material about this busy, modelgenic station on the old Long Island Rail Road. John Lucas, from Troy, Alabama USA, was intrigued by our previous discussion of railroad coal transfer operations that form prototypical oval layouts. “I have been considering modeling such a facility as a future layout,” John explained. 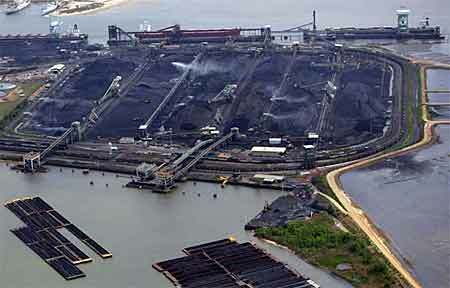 “I had looked at the McDuffie Terminal in Mobile, Alabama (left). I envision this much as you suggested, with a pizza layout in a picture frame box. The train would appear on one side like it was coming out of the loader and slowly cross the front of the layout. You could also have animated loading and unloading machinery. I would also use a sound track and lighting effects—maybe a sunset or approaching thunderstorm.” Sounds good to me! Long-time railwayman Mike McLaughlin, from Denver, Colorado, USA, drew our attention to the “small Ottertail Power Co. plant in Devils Lake, North Dakota that would make a fine micro layout, I do believe.” Mike enclosed several photos as well as a track drawing (right) that he made some 40 years ago during a visit to his wife’s family in ND. Mike’s memory was still bright. “What makes it neat—and modelable—is that it had no humongous coal pile, wasn’t served by unit trains, and provided regular, interesting operation. At regular intervals, a small four-wheel Davenport ‘critter’ emerged from the plant pushing a couple of empties out onto the empty track and then ran back through the plant onto the tail track. Forward on the load track, grab two loads, back onto the tail track, then forward into the power plant and the dump pit. Repeat as necessary. Mike promptly filed the material and forgot about it… until our feature on modelable prototypes brought it to mind again. 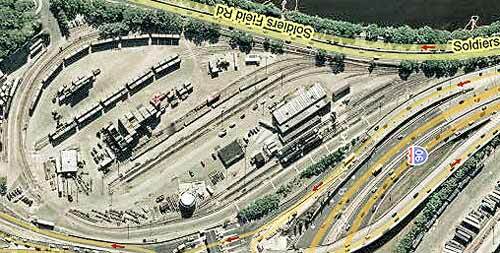 He continued, “Well, it’s been a long wait, but see the HO micro layout drawing (above). An 8x72in (20x180cm) base holds the power plant (a thick building flat) and the relevant trackage. It’s designed to accommodate a ‘critter’ and one hopper car on the tail track and in the dump part of the plant (better believe they keep the engine inside during North Dakota winters!). “The empty track is roughly 4+ cars, while the load track can hold about 7 cars—gotta keep the spastic delivery patterns of the MStP&SSM in mind. A roughly 30in (75cm) cassette provides the connection with the Big G and the rest of the outside world. 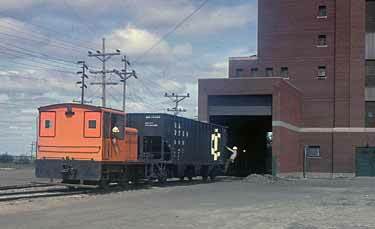 “In operation, the cassette with Great Norn NW-5 #192 and up to 4 hopper cars is plugged in and the loads shoved into the load track. Then the 192 pulls the empties off the empty track and the cassette departs for the real world. (At the time this all took place the 192 was the switcher and both my six-year-old daughter and I got an extensive ride on the unit.) Periodically the critter goes through its routine and gradually the loads become empties awaiting the next GN switch. I’d suggest that a random number of loads be spotted each switch, per the prototype.” There you have it… authentic power plant operation in a micro layout! The two photos below were scanned from Mike’s 40-year-old slides, to give an idea of what the equipment and the plant looked like. Alas, none of this any longer exists. THIS PROTOTYPE RETURN LOOP (BALLOON LOOP) IS IN CENTRAL BOSTON! Right in the center of Boston USA is a prototype return loop (balloon loop) that was spotted by Omar Lehr. He remarked, “Looks like they service engines and do a little intermodal. 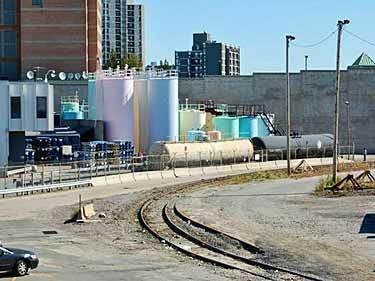 The tanks to the NNE [upper left beyond picture area in left photo] are pastel pink, blue, and green. You can look into it when exiting I-95 at rush times.” Satellite view and map are from Google Maps; bird’s eye view of yard throat courtesy Bing Maps. Carsten Weye Jensen, from Holstebro, Denmark, was one among a number of people who were intrigued by the remarkable Ballard Terminal Railroad online tour, referenced in Scrapbook #85a. Carsten says, “This layout is five square feet. It’s a whole railroad, not just a single line of track or a few turnouts with track, with no sector plates and no hidden track. 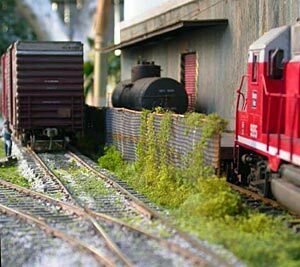 This is the entire Ballard Terminal Railroad in Z-scale. 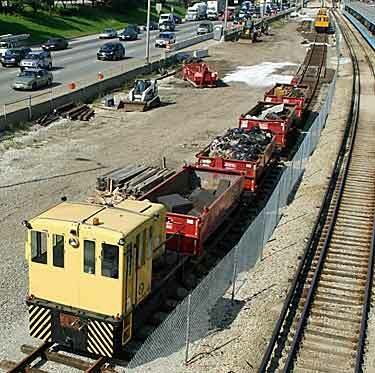 Doug Kaniuk, from Chicago, Illinois USA, discovered and photographed a small contractor’s railroad in an expressway, built to “haul out the garbage.” Doug has posted a web page about the line, including a lot of excellent photos like the examples shown here. The line is a push-pull, back-and-forth railway; it interchanges at one end with the Chicago Transit Authority line. In a model, the CTA transit cars could be constantly passing by in the background, as the little GE 25-tonner does its switching chores in front. 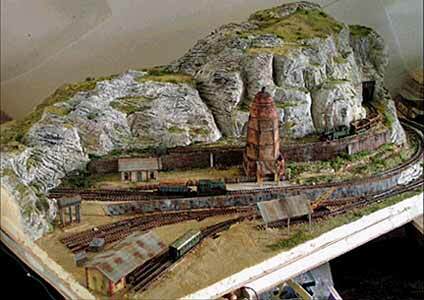 Briton Norman Woollons, who lives in Abu Dhabi, United Arab Emirates, discovered an isolated and exotic small and modelable railway in England. 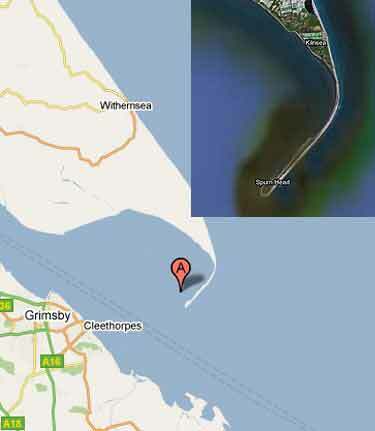 He writes, “On the East Coast of England, the wide gash of the Humber Estuary (above left) is separated from the North Sea by the Spurn Peninsula. A visitor today, might notice one or two places where rails, embedded into the concrete slab road that leads to the ornithology reserve, appear from the long Marram grass, crossing diagonally first left to right, then right to left (below right). 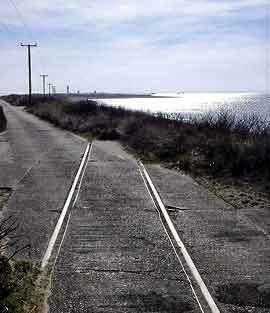 The railway was built in 1915 and most of the track was removed in 1951. 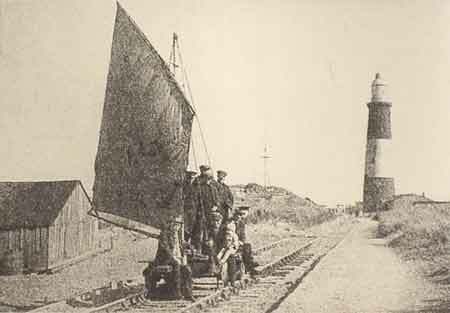 Between times, there were small steam engines, rail cars, an Italia 1914 petrol racing car converted to rail use, and perhaps most famously, sail bogies (trucks with sails – below left), all running on this track at one time or another. 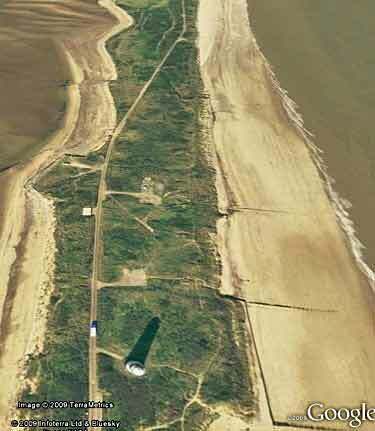 For more information, Google “Spurn Head (or Spurn point) Military Railway”, or look at the SKEALS web page. What a scene for modeling… complete with lighthouse! 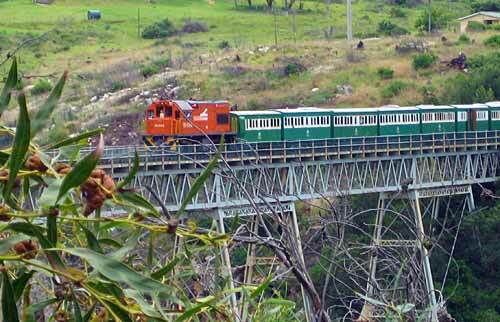 From Jon’ Lorton, in Chippenham, Wiltshire, England, comes a photograph of the 60cm (two-foot) gauge Apple Express tourist train in South Africa, crossing the Van Stadens bridge, reputed to be the tallest narrow gauge bridge in the world. Jon comments, “The train is on the Avontuur line which starts at Humewood Road station in Port Elizabeth. “The Avontuur line is something of an icon both running over Van Staden’s bridge and being one of the longest two-foot gauge lines still in existence, with sharp curves and steep gradients along the way. The full run, one way, is about 285km (177mi)… The line originally came into existence to support fruit farming in the Langkloof (long valley) by providing transport for produce to Port Elizabeth for onward shipment. Most of the later traffic was carrying limestone.” There’s more info at the Apple Express site. Jon’ took the photo while on holiday in South Africa earlier this year. Tim Cotter writes from the Falkland Islands: “For many years, Soviet warships had railway systems (replenishment rails) on the upper deck to move ordnance around the main deck. 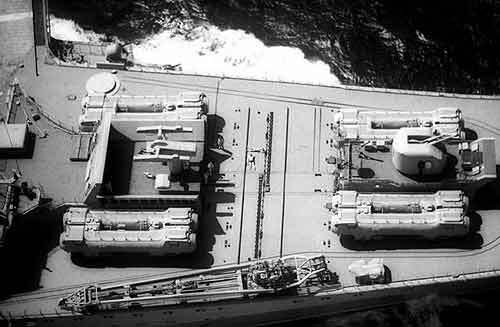 In particular, the carriers Kiev, Minsk and Gorskov (ex-Baku) had full length systems, with switches and turntables. The track started on the port bow, meandered around the fo’c’sle serving the various launchers and then departed down the starboard waist to the starboard quarter where there was a ‘yard’ of two parallel sidings in the plane parking area… I would guess the gauge to be 500-600mm by looking at the Kiev’s sunbathing sailors on the deck.” On The Ship Model Forum, Dave Wooley is making a scale model of the Kiev, including the rails. Coincidentally, Neil Tice writes from Oregon USA: “In a mad session of Wikipedia-reading, I’ve learned that the Royal Navy put shipboard railroads to sea in the Lord Clive class of shore-bombardment monitors… The ammunition was so large, apparently it was hauled from the magazine to the gun by a narrow-gauge railway laid on the deck!” How about those examples for prototypes of railways in cramped spaces! In Scrapbook #88, we linked to Ken Olsen’s marvelous four-part video of a railroad switching turn at a steam-powered sawmill deep in Oregon USA. 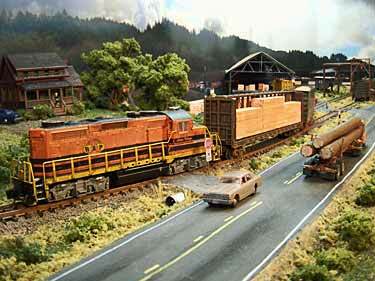 Ken has also built a 1x4ft (30x120cm) N-scale bookshelf model (right) of the Hull-Oakes sawmill. 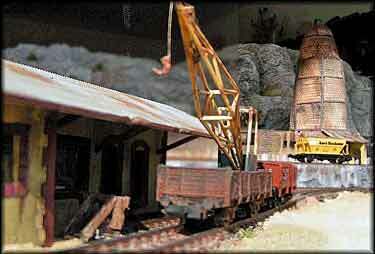 The layout is called Dawson Station and has received the “seal of approval” from the operating gang at Hull-Oakes. Ken has now put together a website about the whole experience and made a video of a switching session on his N-scale line. You can view this remarkably realistic model in action by clicking on the triangle below.